If someone was on the computer, they could not decide what was watched on the TV in that room. Since there was another TV in the basement, and one in our bedroom, we managed to keep everyone happy. But, I had to get up at five to write before anyone else woke up. I found I needed complete quiet to think. It was frustrating. 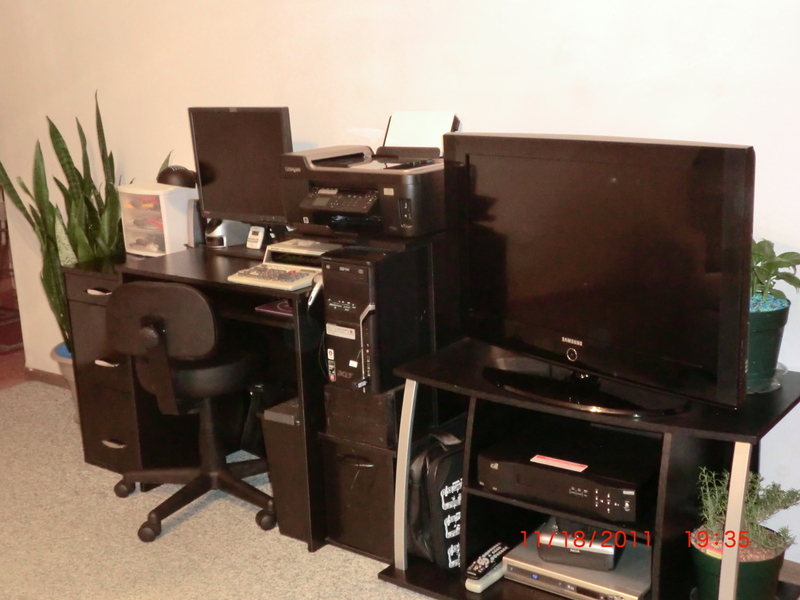 TV wall with computer desk. When my daughter moved out, our youngest son moved from the nursery to the basement room she formerly occupied. I started writing in the nursery. 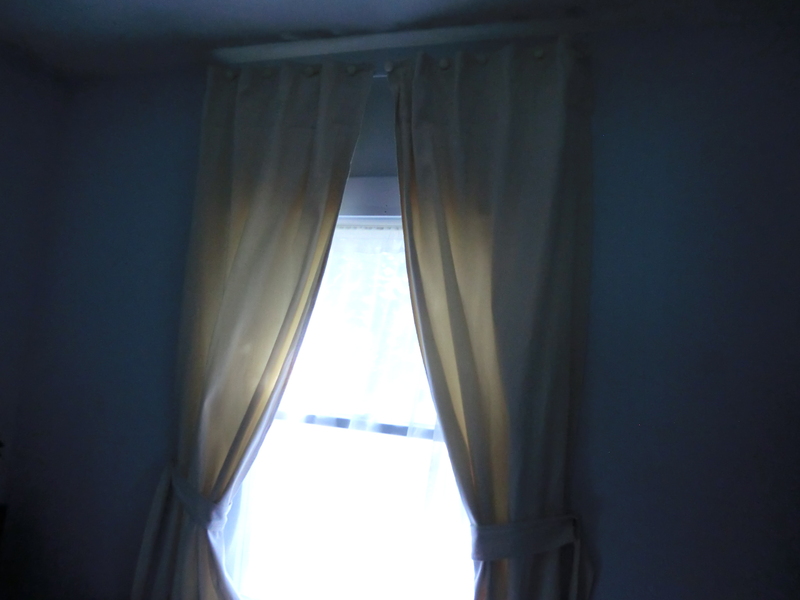 It is painted a calming blue and I even enjoyed making the drapes for the room. My drapes made from a drop cloth. My oldest son was in and out between college, basic training, and deployments. He moved out about the time my daughter moved back in. I gave her the choice of bedrooms and she asked for the nursery. We called it her cubicle because she had a queen-sized bed, dresser, TV, bookshelf, and refrigerator in it. There was a path to the bed and she rarely emerged. 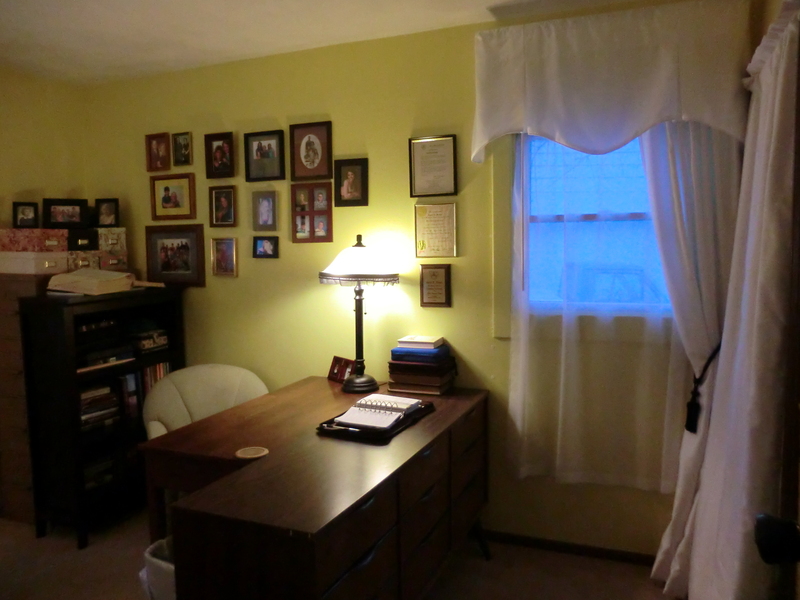 We set up the office in the larger bedroom and my husband and I shared it. It really helped my diet because it was not ten steps from the refrigerator being located on the opposite end of the house. But it was not quiet. 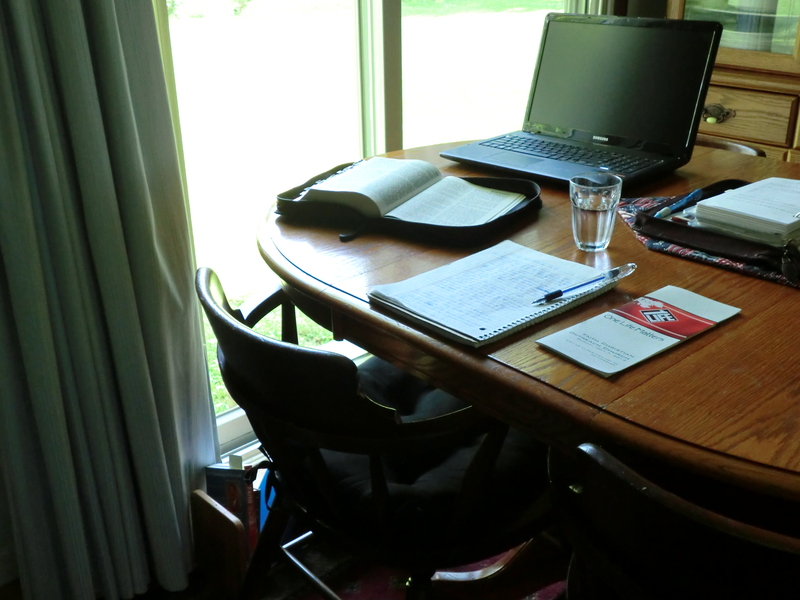 I moved a few books and my Chromebook to the couch and was back to writing early in the morning. That worked except during the hottest months. I had to keep the drapes closed and moved to the kitchen table. It was not quiet and I gained weight. A year ago, my daughter moved out again and my granddaughter decided it was her room. We keep an air mattress in the former nursery and that is where she sleeps when she is here. She grew up too. She is in preschool now and won’t be dropping by as often. The nursery was once again open. Today I moved back in. The air mattress will have to be deflated, but it is quiet and that is the number one thing I need when I write. I need to be alone with my thoughts to sort them out. There’s an echo in the nursery that I need to correct. It is not the sounds of a crying baby, just the sounds of empty walls. I need to bring some artwork in here for inspiration! This entry was posted in Use What You Have and tagged Important Things, Use What You Have, writing101 by Frugal Fish. Bookmark the permalink.